This whisky has been written about so many times I feel like I’m saying,me too, but I think it only proper to review it. I have had TEN out many times but have never really purchased a bottle many times. Typically I shoot for the special releases of Ardbeg which I invariably end up paying way too much for due to their availability. But today they had a sale on the TEN and my inner Islay was saying do it. So I did. I had the Ardbog (not a misspelling) special release yesterday and it was simply marvelous. I really expected a bit more peat in it though, but it’s really polished. 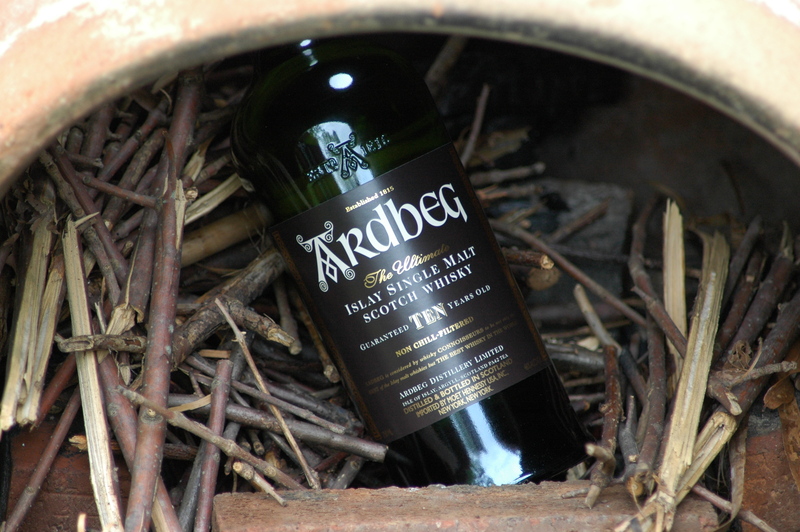 The TEN is a lighter side of Ardbeg. Still delivers lots of peat and pepper on your palate but really is a good daily drinker for those of us who prefer some peat in our whisky. So when I decided to take a photo of this precious one, I thought I’d find a nice patch of green grass to complement the green bottle.I happened to walk by my fire pit, or Chimnea. I had placed some small wood in it already and thought, yes, it is only fitting for a peaty “fired” malted barley whisky to be placed in there. So there you go. So tasting this expression is unmistakable Islay peat. It is really a level tasting experience. The spirit is consistent from taste to swallow and your first couple of sips will be formative. After a few your buds become numb and you notice more of the flavors. Overall a fine whisky…. just don’t make it your first Scotch whisky. At 46% ABV you may want to add water, I find it pleasing neat however. If it makes you want to eat bacon, you are normal. Their web-site is quite nice!